On an ordinary day, Fulbright Foreign Language Teaching Assistant (FLTA) Andrey Tikhonov from Russia would pour himself a cup of coffee at the cafeteria, pay with his meal card, and walk back to the dorm lobby to meet a student for a study session using comparative forms of Russian adjectives. This might sound like the typical day for many Fulbright FLTAs who are visiting the United States for the first time, but for Andrey there was one distinct difference: he is blind. When Andrey first heard about the FLTA program, he felt it was a perfect opportunity for him. Right from the beginning of the process, Andrey found there were many resources at his disposal. However, before he even left Russia, he began to find answers to some of these questions when his future supervisor at Michigan State University (MSU) and the MSU Resource Center for Persons with Disabilities got in touch with him to find out what sort of assistance and technology he would need when he arrived. By the time he landed in the United States, many of these arrangements had already been made. 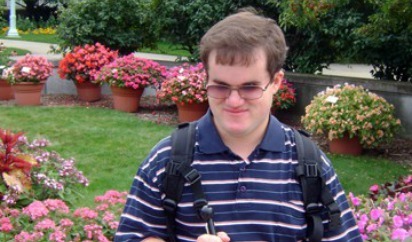 Over the course of the next several weeks, Andrey received orientation and mobility training from Michigan State University, including new techniques for using a white cane, and staff helped him learn routes around the campus and around the cafeteria. Despite the challenges that Andrey has faced having a disability in a foreign country, much of his day-to-day life still focused around the activities of being an FLTA – helping students learn Russian, learning conversational American English and acting as a cultural ambassador on behalf of his country.